Artist Jim Denomie paints in his Chisago County home. Photo by Allison Herrera. One of the first things you notice at Jim Denomie’s home and studio in Shafer, Minnesota, are the horses. I’m not talking about live horses. He collects spring horses, like the ones you used to ride outside of the hardware store as a kid. There are about ten of them all in various conditions facing a trail on Denomie’s vast Chisago County property. He says they’re for his grandkids, but really they might be for him to have another playful go at childhood. I remarked that those horses look like some of the ones depicted in his paintings and asked if he uses them as models? Yes, he does. “Every time my photographer friends come out, they have to take pictures of them,” Denomie said while guiding me around his property that early spring day. Denomie built this studio in 2003 soon after relocating from Minneapolis to this quiet country dwelling. He enjoys being able to come into the city as he pleases for events and to join in community, but treasures the solitude of the nearby lakes and open fields by his home. Denomie’s studio space is crammed with small toys, a collection of paintings he’s done over the years, stacks of books, endless tubes of paint and of course rabbits. Not live rabbits, but paintings, toys, masks and figurines. “I have a very strong personal connection to rabbits, something I couldn’t define to anybody. I can feel it, I know what it is,” Denomie said. It’s the playful spirit and elusive nature he identifies with and in his paintings, Denomie said the rabbits are often times a stand in for him. Denomie’s work is some of the most important I’ve seen because it speaks to the painful and lived experiences of Native people in Minnesota and all over. Indeed, his work is recognized all over. 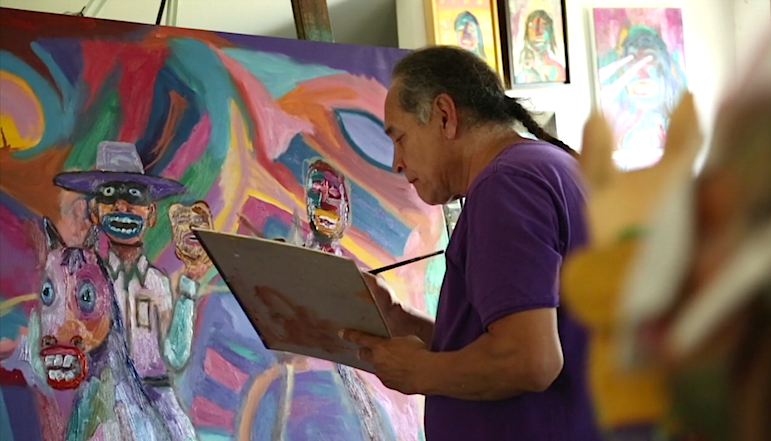 He has exhibited at galleries all over the world, received a McKnight Fellowship in 2013, and won awards from the Eiteljorg Museum of American Indians and Western Art in Indianapolis, among numerous other accolades. “I asked if I could transfer to a school so I could focus on art. She told me that was a bad choice. There’s no money in it, no future, no security. Well, I said, it’s either that or I drop out of school,” he said. So at 16, he did drop out, got a minimum wage job, found drugs and alcohol, and spiraled into a 20-year battle with addiction. When Denomie overcame that battle he enrolled at the University of Minnesota earning a bachelor’s of fine arts in visual arts with a minor in American Indian studies. But even with the degree, Denomie realized that he wasn’t able to easily secure employment. “[I was] qualified to drive a cab or go back to drywall,” Denomie said. He couldn’t find work as an artist so had to improvise. “I went back to drywall, but this time it became a vehicle for me. It allowed me to paint what I wanted to paint and not necessarily what would sell. I was able to paint images that were more challenging and more political,” Denomie said. While at the University of Minnesota, he became more involved with the American Indian community on campus. Like him, some were taught little about their heritage as products of white colonization. 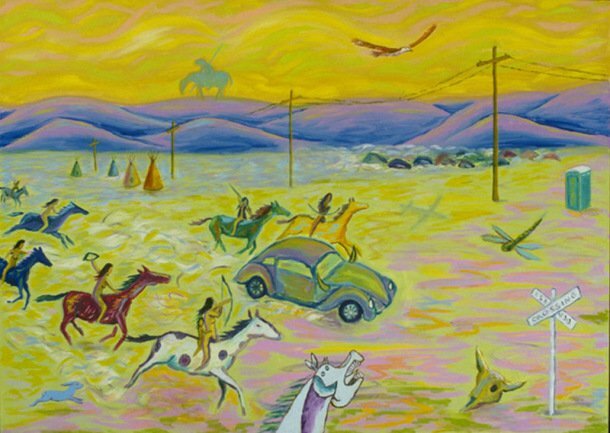 As Denomie studied more about things like the reservation system, genocides that happened to Native people and treaty violations, the more he wanted to highlight that in his paintings. He was also aware of the labels that might be placed on his work. So, he focused on turning some of those stereotypes on their heads, incorporating them into his large scale work, and figuring out how to represent his politics, his race and himself. “I wanted put my identity in the work, but first I had to define what that identity was,” Denomie said. One of Denomie’s first bodies of work, “Renegade” series, commented on the reservation system. 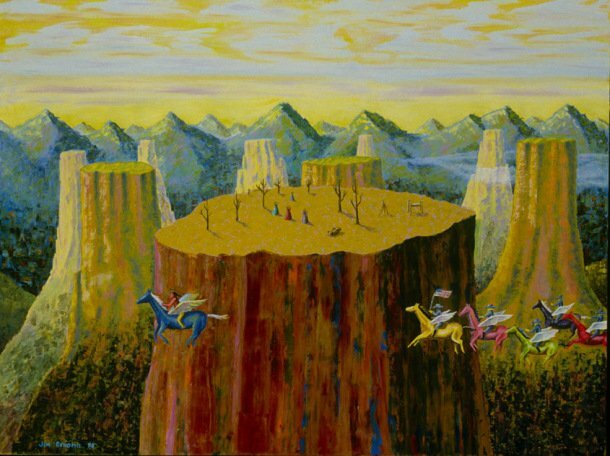 It featured horses flying above mesa tops using some of Jim’s signature bright colors, sweeping landscapes and crudely drawn figures on horseback. He created one of the first paintings I saw on the US Dakota war called “Off the Reservation/Minnesota Nice.” Seeing it reminded me of the stories I’d heard on the 2010 Dakota commemorative march that takes place to honor those who died on a forced march from southern Minnesota to Fort Snelling. The Renegade by Jim Denomie. The power of the painting and it’s placement above the fireplace in the James J. Hill House was remarkable. Denomie uses colors and rough brush strokes in his work. It’s his signature style. His subjects are depicted with crudely drawn open mouths with buck-teeth shaded in bright orange, pink or a moody blue. He employs rabbits, birds and winged horses as messengers in his work. “Jim Denomie is probably one of Minnesota’s great treasures, As an artist, he approaches subject matter that is very personal to him with a sense of humor and a sense of anger,” said Brian Szott, a curator at the Minnesota Historical Society. He along with Dyani White Hawk Polk curated an exhibit called “De Unkiyepi/We Are Here” in 2012 to remember the U.S.-Dakota War of 1862. Manifold Destiny by Jim Denomie. Most of the time, Denomie uses humor to deal with painful subjects relating to the history and mistreatment of Native Americans. But the work he created for the exhibit is raw with emotion and anger. In one corner of the painting, Denomie depicts a starving family – a mother and daughter hold out a plate while the head of a man with a noose around his neck holds out a spoon. “One of the reasons the uprising started was that the Dakota people were starving. They were taught to be farmers, their crops had failed. They were owed food and money,” Denomie explained of the scene. Denomie said that the noose represents the hanging that took place of the 38 + 2 Dakota men after the war. “When I set about to do this painting, I purposely decided to keep the story more raw and brutal,” Denomie said. In another painting titled, “Non-Negotiable,” Jim depicted two Native people in the trunk of a police car. He’s referring to a 1993 incident where two Minneapolis police officers were accused of transporting two residents from Little Earth Housing complex in their trunk. Denomie also painted the number “1862” on the squad car. “It made me wonder if the attitudes of these police officers share the same attitudes as in 1862,” Denomie said. But Denomie’s work isn’t all about protest. Some of his best work are his portraits, which initially grew out of an exercise he began in 2005 to build up his technique drawing landscapes, animals and people. In total, he has created 430 portraits. White Hawk Polk, a Sicangu Lakota artist living in the Twin Cities, said Denomie’s portraits elicit a powerful and emotional response. “I remember looking at it and at first being shocked by the imagery – it was the imagery of his portraits. And I was really struck by the gritty way he depicts people, Indian people in particular,” White Hawk Polk said. White Hawk Polk was a young painter attending the Institute of American Indian Art when she first saw his work. Denomie is sensitive to non-Native’s taking on Native issues, themes and motifs in their work. I asked him about Jimmie Durham’s exhibition, “At the Center of the World,” that’s currently showing at the Walker Art Center. Durham claims Cherokee ancestry, but many in the collective Native community cry foul, saying that there is no proof. In a recent Star Tribune article, artists Rosy Simas and White Hawk Polk met with Walker director Olga Viso to express their concern over why Walker officials didn’t meet with the Native community when considering this work. In an article on Artnet News, Cherokee artist America Meredith is quoted saying she found no Cherokee ancestry in Durham’s tree. Denomie says that there are times when non-Native people can depict Native themes in their work, but that approach needs to happen with caution. “I don’t believe it is okay for non-Native artists to comment on important, painful history unless it is from a non-Native perspective that is respectful to that history and the communities involved. Otherwise they run the risk of exploiting or appropriating Native property for recognition or money,” Denomie said. Durham’s exhibit wasn’t the first to create controversy and stir up the conversation on Native appropriation. Before him there was Scott Seekins who painted a series of himself intervening in the middle of the U.S-Dakota War. In September 2016, white artist Dale Lamphere debuted his 50-foot sculpture of a Lakota woman titled “Dignity” near Chamberlain, South Dakota. And then there was the Walker’s Sculpture Garden, which couldn’t reopen on June 10 due to protests over Sam Durant’s replica of the gallows used to hang 38 + 2 Dakota men and women titled, “Scaffold.” Dakota elders, fellow artists, activists and community members eventually pressured the Walker into taking it down. When I last visited Denomie at his home he was putting the final touches on a painting called “Oz, The Emergence.” It’s a surreal painting playing off a scene from the Wizard of Oz where Dorothy and the trio are walking through the apple tree forest. The trees come to life and are mean to the group. but of course Jim added his personal touch to this image with scenes of police brutality and Standing Rock. The painting was shown at Bockley Gallery, which represents Denomie and was purchased by the Minnesota Museum of American Art in Saint Paul. This fall, Denomie is exhibiting more work at the Plains Museum in Fargo and in 2018, he plans on publishing a book. I’m in the final stages of making a movie about his work and influence on contemporary art. It’s called “Rabbit,” or waabooz – the word for rabbit in Ojibwe. Rabbit, will be finished by the end of 2017.